Along with my review today, I have an excerpt and a giveaway for you! Title: And They All Lived Happily Ever After! 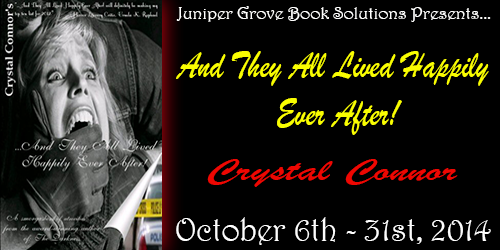 Crystal Connor’s …And They All Lived Happily Ever After! is a collection of short fables not meant for children; but for those who enjoy the madness of nightmares. In the ‘Queen’s Pawn’ you’ll visit a magical kingdom full of wonder and splendor only to come to the sickening realization that when the Queen had a message…she sends her pawns. The perils of eating forbidden fruit have been cautioned against since the Book of Genesis, but will our urban princess in ‘The Apple’ heed those warnings? Embark on a mystical and treacherous quest to reach ‘The Ruins’, located in place so sacred that is should never be visited by mortal man. These are just a few of the adventures you’ll have as you explore the dark imagination of Crystal Connor. Fourteen short stories of horror, science fiction, and fantasy; 65,306 words of terror by a single author who clearly intends to one day be known as a Master in the genre. Monsters, Women, and Villains (oh my)! There’s a whole host of benefits allotted to those, who like myself, possess these very specialized set of skills. One of the benefits is, that afterward, you sleep really good at night and I mean really good. time favorite and I’ll show you why here in a minute. Now, I can understand why you broke into my home, these are tough times, and a guys gotta eat I get that. I do. Maybe I would have let you live if you had simply demanded my money and jewels, but, then again, I was never known for being charitable. I was given this audiobook download of “…And They All Lived Happily Ever After” in exchange for free in exchange for review. 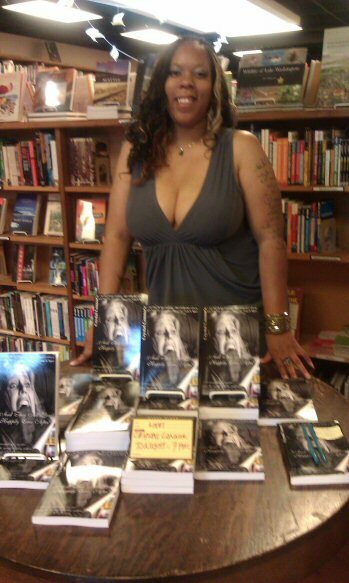 This is a collection of short stories by Crystal Connor, and was read by Kay Richardson. This anthology is great, because even though all of the stories are by the same author, they are so diverse. Kay Richardson does a beautiful job reading the stories. This was my first anthology audiobook, and I was concerned at first that all of the stories would sound exactly the same, since they are read by the same person, but that was not the case at all. The stories being read by the same person did not affect the diversity of the stories. It really does seem like each story is told by a new author. There are stories about the zombie outbreak, voodoo, ghosts, a twisted take on Santa Claus, and more! I love reading horror stories, and just in time for Halloween! My favorite story was Best Friends Forever, which is told through letters and diary entries. I’m not going to tell you what it was about, because I don’t want to give anything away, but it is awesome! Another really good story was Amber’s New Friend, about a ghost named Asha who doesn’t want anyone else to live in her house, and how she harasses the family that had the misfortune to move in there. Generations Apart was really unexpected also! This collection of stories is really good. I will be looking for more from this author. I wish I had a physical copy of the book. I will be looking for more from Crystal Connor! What do you think of audiobooks? Do you get the physical book if you love the audiobook or is that enough for you? Will you be checking this one out? Previous Book Blitz — Interview with Isla’s Inheritance author Cassandra Page + GIVEAWAY!